Surely the rest of the Girl Scouts science classes must be on the next page of the pamphlet, right? If I hear “Evolution is only a theory!” one more time, my head might very well explode. What in hell goes on in the schools? Maybe, instead of the dumbed-down GEE-WHIZ-WATER-IS-WET science that is designed to break the hearts of the kids who really care and bore the living snot out of the rest of the class, we should step it up a bit. It’s not like the kids who aren’t already motivated are learning anything anyway. Maybe we should start explaining the difference between a hypothesis and a theory about the same time kids start growing their little bean plants in paper cups at the back of the classroom. Good gravy, they are taught all kinds of cockamamie prayers at the same age that you have to convince them that library paste is not a foodstuff, no matter how lovely it smells. If they are old enough to study the life cycle of a frog, they can be exposed to the scientific method*. Just give it to them along with their dip nets and food coloring and magnets. Kids are a lot smarter than we give them credit for and this is a good thing. * This probably wouldn’t fly in Texas. Thursday morning, ninth-graders in the second-hour science class at Maple Grove Junior High School had turned their desks toward the science table where teacher Matthew Achor conducted experiments for the class final. Several students were injured during this science experiment. One of the students, Dane Neuberger, was severely injured with second degree burns to his face. All of the students are expected to make a full recovery, and according to the article it doesn’t look like Neuberger will need skin grafts. Only minor damage was sustained to the classroom. Details are slim in the article, but it sounds like the appropriate actions were taken after the explosion. A fire blanket was used to wrap Neuberger and an ambulance was called immediately. The room was evacuated and the fire department was called to investigate. The article doesn’t discuss the type of bottle or the amount or type of methyl alcohol employed in the experiment. The science behind what was being taught. The purposes of this experiment could be to demonstrate an exothermic reaction, oxygen supply in combustions (if a narrow-necked bottle is used as heat, flame and gas exits the bottle, fresh oxygen is sucked back into the bottle, re-igniting any remaining methanol vapor), detonation velocity, expansion of gases, etc. The way it works is that liquid methanol is put into a bottle and allowed to evaporate, leaving methanol vapor in the bottle. Heat energy – a match, in this case – is added to the bottle, causing a combustible chemical reaction. Visible flame and a loud whoosh” is heard during the reaction. The methanol vapors are ignited, and liquid by-product (H2O) is left in the bottom of the bottle. In the article above it’s mentioned that this teacher had been performing this experiment for years, and I found several online mentions of this as an acceptable high-school chemistry-level experiment. Some sites perform the study outdoors, some indoors. I do not remember this experiment performed when I was in junior high or high school. Science teachers – Do you use this experiment in your classes? What safety precautions do you employ? For the rest of you – Do you remember this experiment from your days in the chemistry classroom? Did you have any larger-than-intended explosions? Of course it’s a PETA shirt, which is one mark against it, but it’s the joyous anti-intellectualism of the message that first slapped me in the face. 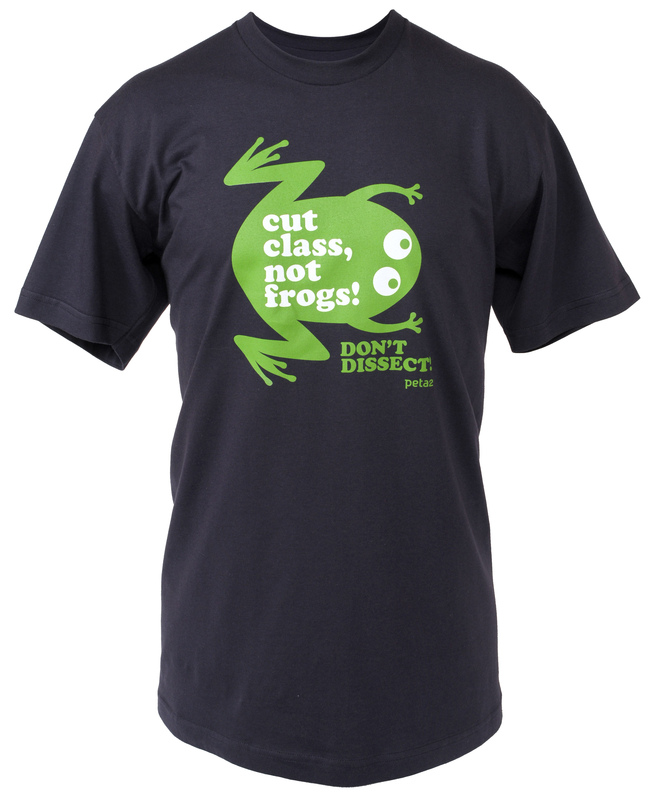 The cutesy message about cutting class makes me want to take a shower. Remember this summer’s marketing disaster for JCPenny – the “I’m too pretty to do my homework so my brother has to do it for me” t-shirt? Same sort of thing, but more gender-inclusive; Everyone can be anti-learning with this shirt! I’m making a lot of assumptions in these next couple of sentences, but they’ve held true in my experience. Don’t skip class – you miss out on interesting, important information. I’ve found that when I skipped classes, it was harder to grasp the big picture, and so the subject seemed more out of my grasp. Once this downward spiral starts, it’s easy to just pretend that the material is boring or irrelevant because you’re missing an entire hour’s worth (at least) of facts or information! Also, whatever you’ve missed is probably going to be on the test, and you’ll feel a lot less stressed and like more of a superstar if you do well on the test…you know, rather than failing it. Second – do dissections! It’s not gross, it’s not weird, it’s cool as hell! You are looking at the internal workings of the machinery that drives a living being! The National Science Teacher’s Association supports animal dissection and believes that it can help students develop skills of observation and comparison, discover the shared and unique structures and processes of specific organisms, and develop a greater appreciation for the complexity of life. The wet lab portions of my high-school and college A&P classes were amazing! Seeing how fine the nerves were, how intricate the cardiovascular system, with all of the tubes going into and out of the heart and through the lungs, and understanding how long the small and large intestines really were as they moved through my gloved hands for a length of time that seemed to go on forever – these experiences fueled my interest in anatomy and inspired me to ask questions in ways that I doubt a computer program would have. So much of what we do these days is digital, and I suspect performing a necropsy on a computer screen would be just another game for me. My Anatomy and Physiology students attend a high poverty school that has limited resources and monies available. They are juniors or seniors who have identified their career path to be in the health science field. Some have set goals to be lab technicians while others strive for their doctorates. All of them want to learn and are interested in the structure and function of the human body. We have an enormous amount of fun learning and utilizing the limited resources we have. My Project: Future nurses, health care professionals, and doctors will be inspired to pursue their dreams by having hands on experience with preserved specimen dissections. Dissection tool kits, virtual dissection tutorials, and basic specimens of sheep eyes, hearts, and brains will create a curiosity of the structure and function of the human body that will last a lifetime. Science is a difficult and intimidating subject to many teenagers. My goal is to remove these obstacles by providing lessons that motivate my students to learn and strive for a college degree. Hands on activities and labs are the pathway to see my students excel not only in science, but also in their life. If you can spare $5 (or a few $5!) and you’re feeling sentimental about your old frog dissection days, why not stop by her website and help out? At the time of this posting, Mrs. Greene is only $109 away from meeting her goal.